Back in the old days, in the late eighties and early nineties, when I was a struggling young musician with more talent than money, all I wanted was a KORG synthesiser. The other spotty oiks and I would linger longingly in music shops before we were tazered out of the door by surly assistants, wishing we could scrape together the thousands of pounds the beautiful big KORG keyboards cost. The M1 was, and still is, the biggest-selling digital keyboard of all time, bigger even than the Yamaha DX7. Successive KORG keyboards introduced staggering new levels of sonic wickedness - every synthesised sound was like the opening of the soundtrack to Bladerunner, or Dune, or, hmm, Never Ending Story. The trouble was that each sound was so distinctive that you could only really use it once. Which meant that, 128 songs later, you'd pretty much rinsed your keyboard. While other companies pursued higher and higher fidelity samples (i.e. recordings of actual instruments) KORG pursued synthesising excellence. They got excited about manipulating sounds rather than emulating them. And they starting making weird new electronic instruments that didn't look like instruments, but looked like a table-top Pong game, or possibly a Magna Doodle. They took synthesising technology, effectively stuff from the sixties and seventies, and found new ways to present it. Hence the return of bleepy Moog sounds and fat analogue basses to dance music. One of the most popular new pieces of kit was the KORG KAOSS. It was a flat tablet that let you tweak sounds in all kinds of ways. And that is, in principle, what they have stuffed into the KORG DS-10 Synthesiser for the DS, although it's based mainly on an MS-20. In it you get a basic 3-track sequencer, which covers Synths 1 and 2 and four-part Drums. Everything's monophonic, so you can only play one note at a time on each part (but more on that in a bit). 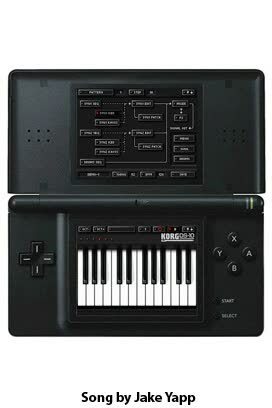 You can input notes via an on-screen keyboard, or on a piano-roll grid, either playing live or step-recording. Once you've done that, you get to play. You can pick saw waves, sine waves, portamento... There are filters, there's even a virtual patch bay where you can draw patch leads from one output to another input, just like in the good old days when a synthesiser looked like a GPO Phone Exchange and weighed about five tons. If you've ever played about with Reason, this will all be gleefully familiar territory. If you haven't, and I confess I haven't very much, it all seems a bit nerdy, frankly. It's fun, and the interface is pretty easy to navigate your way around, but synthesising sound is not hugely intuitive. That said, it's all pretty robustly designed, and it's hard to completely destroy your work. You build a Pattern - a one-bar phrase. You can then copy the pattern and modify it, and as you build them up, you can string patterns together one after the other to build a song. And you can save 18 songs, each containing 16 patterns. Make love to a musical robot.